When choosing fonts for your help project, it’s a good idea to consider the variety of systems your customers might run your content on. Help Crafter content is just Html, and it doesn’t install any fonts on the target system; it just references the fonts configured in the styles it uses. The problem is that the set of fonts on your system isn’t guaranteed to be the same as the fonts on your user’s systems. OS/X groups fonts into two sets – system and user. The system fonts aren’t supposed to be removed or disabled (in fact usually OS/X will restore them if you do) but users can and do disable the user fonts. In addition, applications often install their own fonts, so if you’ve installed something like Microsoft Office and your users haven’t, your system has fonts they don’t have. Using a font that your user doesn’t have isn’t the end of the world – the help browser will choose a font – it just may not be the one you’ve asked for, so your content may look slightly different than you’ve intended. Help Crafter always asks for a fallback of the correct type so the system can do its best. However, most editors want to make sure that their content appears the same on every system. Help Crafter takes a pretty conservative approach to fonts, and tries to encourage you to choose the fonts with the widest compatibility, while also allowing you to choose any font on your system if you want to. The screenshot of the Style Manager below shows how this works. 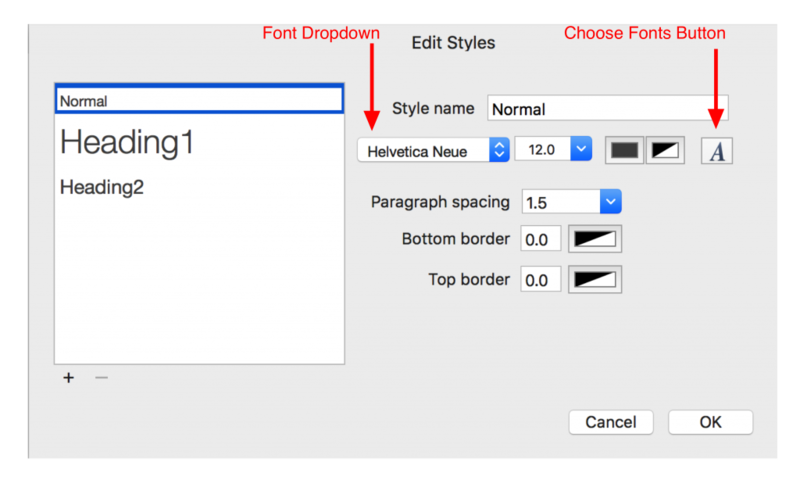 The font dropdown control allows you to select fonts that are expected to be on any OS/X system from Snow Leopard (OS/X Version 10.6) on. This includes only the fonts in the system font set (because the user can’t disable them) and the web safe fonts. It does not include the user fonts installed with the OS, because users can freely disable those if they so choose. As you can see, this limited set of fonts will likely be rendered the same on any version of OS/X your users are likely to encounter. The choose fonts button opens the system fonts panel, and will allow you to choose any font installed on your system. Keep in mind those fonts are less likely to be on the user’s target system – though depending on the font, the risk may be very low. As always, you should test your content on all of the target systems (for Helpbook content) and browsers (for Web content) that you expect your users to use, to make sure you’re seeing what you expect. You can email us at Putercraft support if you find any scenarios we can make better. ← Help Crafter on Sale pending the release of version 2.1!